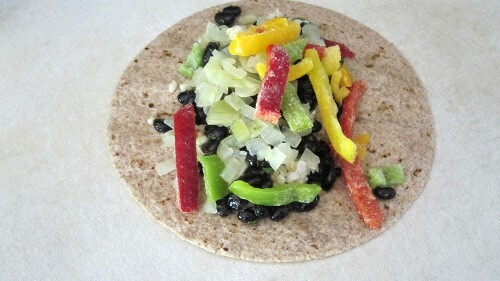 Freezing meals like this vegan bean burrito recipe ahead of time is one of the best ways to prepare for a new baby, and to ensure your family always has a quick meal if no one feels like cooking. 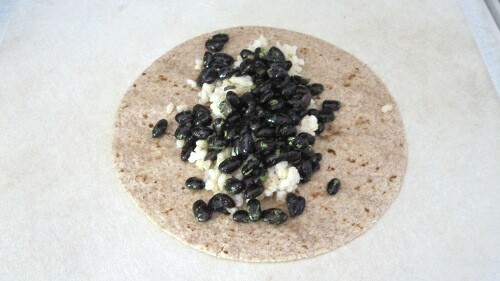 This is a basic recipe for bean burritos that you can adjust based on your preferences. While it did take me about an hour to assemble all the burritos, most of that time was just in preparing the countertop with all my supplies, so it would have taken close to that amount of time to make just one meal's worth of burritos. The glory is that once the work is done ahead of time, all you have to do is reheat when you need to eat. 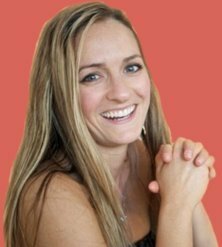 This is an excellent snack to put in the freezer for busy weeknights and hungry teenager snacks in addition to being perfect for your postpartum meals when you don't have the energy to come up with a healthy meal idea. They're also way cheaper than buying vegan bean burritos at the store. I cooked my beans myself rather than buying cans, and only added a little bit of vegan cheese for fun. They could easily be made without cheese. I'd estimate they came to less than $1 each. Start by making the rice. Bring the water to a boil and add in the rice. Return the water to a boil, then lower the temperature to low and cover the rice. Allow it to cook without stirring until all the water is absorbed, about 45 minutes. While the rice cooks, heat the oil in a large saucepan on medium heat. Add the onions and a few pinches of salt and allow to cook until translucent, about 5-10 minutes. 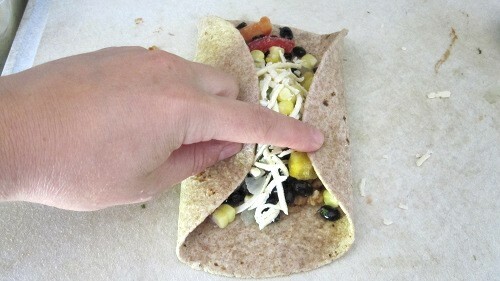 Remove from the heat and put them in a small bowl that you can position near your burrito making surface. Put the beans in two separate bowls and add cumin, garlic powder, onion powder, parsley, salt, pepper and cilantro. Taste to see if you need to add salt or any other spices. Once the rice is cooked, you're ready to assemble. 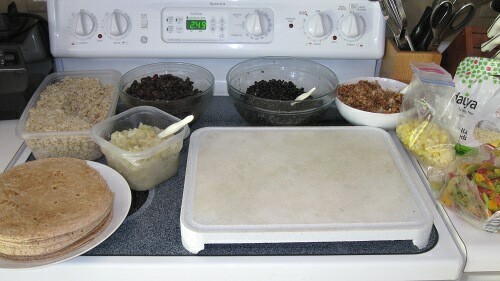 I waited until everything was cooled down and then lined all the ingredients up in bowls in front of my cutting board. 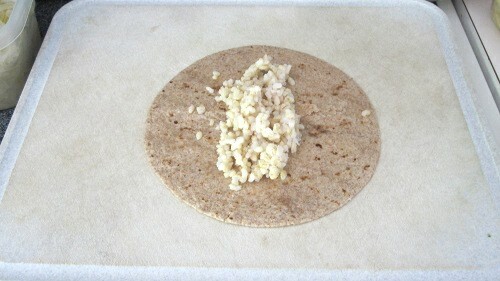 To make the tortillas easier to fold, I covered them with a damp paper towel and microwaved them for 30 seconds. Place one tortilla in front of you. Add about 1/4 cup rice in the middle. Add 1/4 cup beans, and then small handfuls of corn, peppers, and nondairy cheese. I noticed that I added way too much to the first few burritos I made, so I had to adjust amounts as I went along. 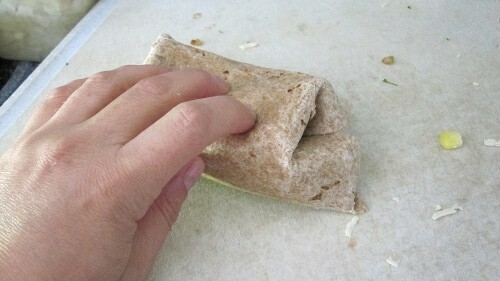 To fold up your bean burritos, start by folding both sides in slightly, enough to hold in the filling. Next gently fold up the end closest to you. Then roll from the bottom up, clasping the tortilla as you go to encouraged the filling to pack into the space you're already filling rather than spilling out the top. 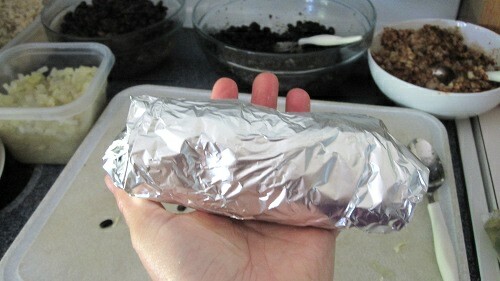 Roll over so the top seam ends up on the bottom of your burrito and then transfer it to aluminum foil. Because these are going to be frozen, any mistakes you make are easily forgotten because it will freeze together and you won't have to deal with the mess until you go to eat the burrito. 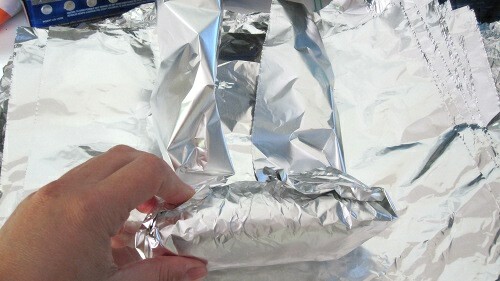 Roll the burrito in the foil one revolution, fold the edges in, and then continue rolling to the edge of the burrito. 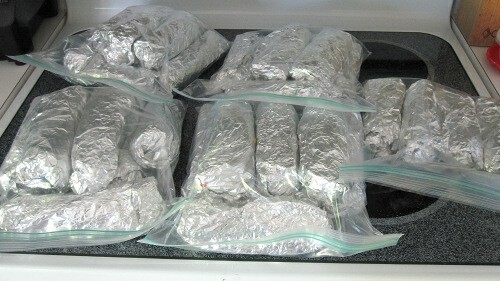 I stored about 6-8 burritos in a large freezer bag. They should last in the freezer for about 3 months, which is perfect timing for preparing in your last trimester and then eating before you start feeling like cooking again. To heat the bean burritos, you can simply pull them out of the foil and place them on a microwave-safe plate, cover with a damp towel and heat for 3 minutes. You could also use an oven or toaster oven to reheat until the filling is warm. 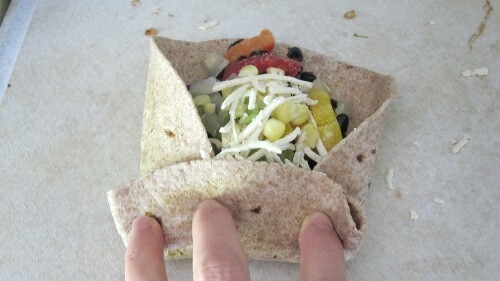 I hope you enjoyed this vegan bean burrito recipe. I'd love to hear your comments and variations on this recipe below.